The work of Ohio TIF is important—and complex. Successfully introducing a new district or statewide program or initiative requires succinct, transparent, and frequent communications with internal and external stakeholders. Effective communications with teachers, administrators, parents, and community members are needed to build awareness, understanding, and support for the work. Participating districts receive customizable materials that highlight key themes about the work and can be used for each district's unique communications goals and needs. Collaboration and open communications have served as the foundation for Ohio TIF from the beginning. Laying the communications groundwork has been critical to our success. Read about how two Ohio TIF districts effectively focused their communications efforts to meet specific district goals. 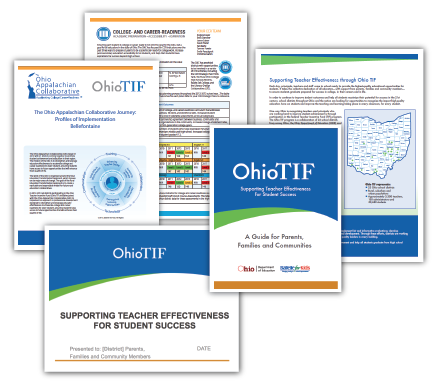 Read the feature article in the August 2013 TIF Talk National Newsletter—published by the U.S. Department of Education and Westat—featuring the work of Ohio TIF in using effective communications to prepare for successful award payouts.